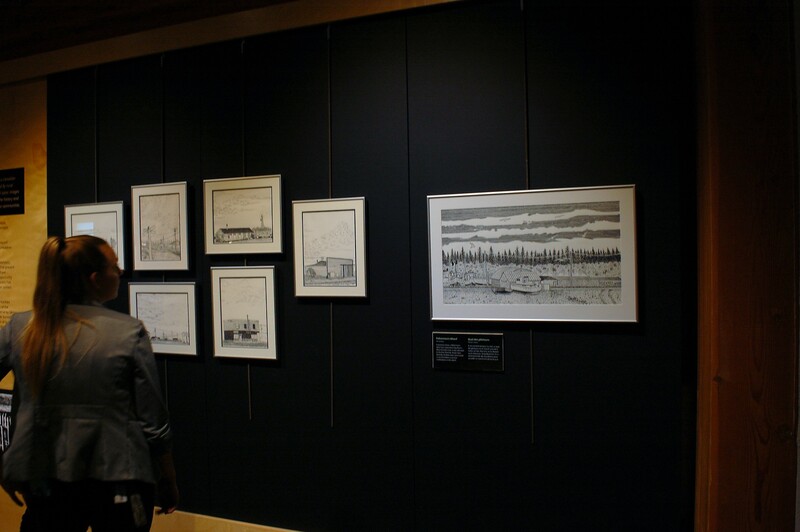 A resident admires some of Hay River artist Chris Robson's prints. The exhibit is on display at the Prince of Wales Northern Heritage Centre until December. Photo by Meaghan Richens. The work of a Hay River artist is now on display at the Prince of Wales Northern Heritage Centre. 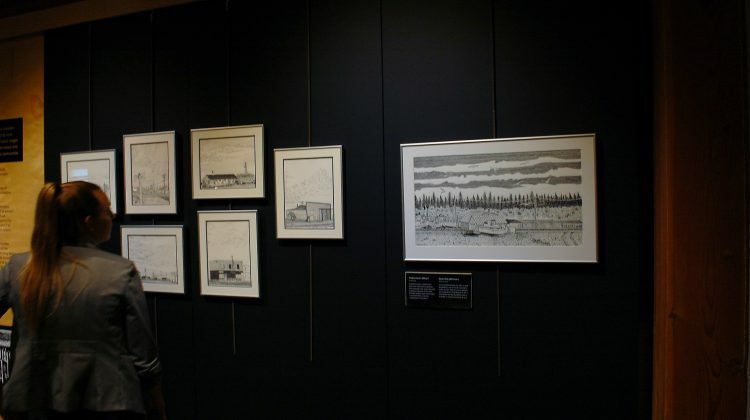 The exhibit, Ingrained Landmarks, features woodblock relief prints and black ink drawings inspired by places in the North. “They’re mostly images from Tuk, Inuvik, Yellowknife, Hay River and Fort Simpson,” says artist Chris Robson. All of the images are from places Robson has travelled to himself, and many are inspired by the architecture of times past. 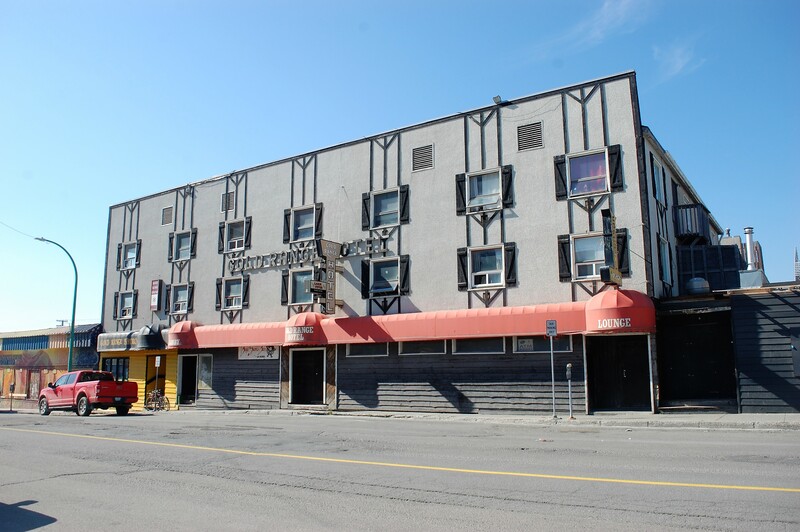 “It’s predominantly older buildings, some of them are no longer there anymore, they’ve been decommissioned or dismantled or knocked down,” Robson says. Some of the buildings in his works are still in use, and Robson has done four woodblock prints of what he calls “iconic hotels of the Northwest Territories,” one of which is the Gold Range Hotel, in Yellowknife. “Those iconic hotels are places where people would probably gather if they came to the Northwest Territories for work,” he says. Robson says he finds these places interesting because they reflect the transient nature and history of the territory. Robson says he’s also intrigued by these buildings because they’re unique. “There’s a diversity that’s so different from down south, from Southern culture, Canadian culture,” says Robson. The architecture in the North has more of a personal touch to it, says Robson. The medium is challenging to work with, especially when he recreates recognizable architectural landmarks in his art. “You have to carve them in reverse into the wood, in order for them, when you’re printing them, to come out properly,” he says. When he first took up printmaking, working in reverse was a real challenge, Robson says, but became easier with time and practice. “Wood is not an easy medium to carve into, you’re working against the grain and it’s a little different from drawing on paper or painting on canvas. It becomes more sculptural,” says Robson. Much like his subject matter, the artistic medium he works in is not as common as it was a few hundred years ago. Ingrained Landmarks will be on display until December 2018.